In 1988 director Paul Verhoeven made his American debut with the violent futuristic actioner Robocop. Dripping with satire and gore in equal measure, Robocop became an instant cult hit. Verhoeven seemed to remake Robocop every few years with a series of increasingly violent and satirical movies along the same theme, including Total Recall and Starship Troopers. These films have bigger budgets and wider scope, yet failed to quite reach the heights he achieved with Robocop. Robocop centres around the notion that a privately owned company – Omni Consumer Products (which incidentally have a similar logo to the Nintendo GameCube) can buy up the police force and rule them as they see fit. They control the police, they control the crime. It’s a pretty scary as concept. Omni Consumer Products want to demolish the city in order to make way for their new project ‘Delta City’. It’s reminiscent of the A-Team really. In order to do this they must first sure up the crime problem, and the way they decide to do this is by creating a violent mechanical psychopath armed with midi guns and rocket launchers. The future of law enforcement, ED-209. 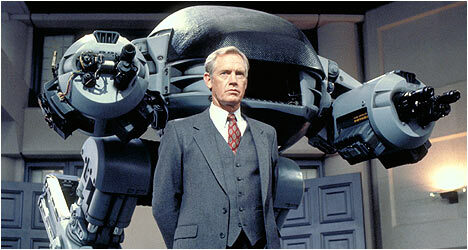 A mishap where ED-209 massacred a junior exec set the project back, and allowed for development of the Robocop project. This was a morally suspect project that positioned heroic members of the police force in areas where they were most likely to be killed, and thus volunteers to become Robocop. Essentially this is a story of revenge. A man gets his family and way of life taken from him in a violent manner, and is given the chance of revenge when he is turned into a powerful cyborg – half man, half machine, all cop. However there are many more levels to the film than that. Firstly his revenge isn’t only directed at the men who murdered him, but at OCP who stripped him of his humanity and freedom. There is the conflict of man verses machine that so frequently crops up in film, but in this case it’s man verses machine in the same person. There is the eternal question of what happens to a human soul after death. When the dead officer Murphy is resurrected, despite all efforts to keep his humanity suppressed, his soul and memories emerge. Add into the mix a satirical comment on the decaying society and Robocop proves to be so much more than an entertaining action film. What of the other two films? Well, Robocop 2 surprised me greatly for I’d remembered it as being nothing more than an inferior remake of the first film. Upon watching it again it is clear that I was wrong. Irvin (Empire Strikes Back) Kershner, no newcomer to making sequels, expertly crafts a slick movie that builds on the decaying society and moral conflict created in the first film. What is more, Robocop 2 hasn’t aged in the last 20 odd years, where as the first Robocop has. Any film that tries to show the future and does so with large wooden TVs touted as the latest in technology is going to suffer from the passage of time. One thing that remains constant throughout these three movies is the use of satirical television advertisements to demonstrate the decaying morals of society. 14 years ago when the adverts for the ‘6000 SUX’, ‘Yamaha – you pick the heart’ and ‘Magnavolt: Leathal Response! car alarms’ first appeared they seemed very harsh and extreme. Compared to today’s society however they could almost be real. This DVD package also gives you the third installment in the Robocop series, the cleverly titled Robocop 3. This rather tame little number is nothing more than a pilot for the TV series. It’s shot like a TV show, written like a TV show and has Robocop befriending refugees, fighting a Japanese ninja robot and flying. The less said about this the better. The only good thing about this third film is the memories it brought back for me from playing the original Amiga game Robocop 3. This was one of the first FPS games ever made and a bone of much contention in our office – was it the first FPS, was it really an FPS? Who cares, it was a great game and much better than the film. Robocop 3 has also been previously released on DVD. The special features of Robocop seem to focus very heavily on the gore aspect of the film, something that hardly needed emphasising. I would have preferred a more in depth telling of the story of how Verhoeven struggled to get the film financed, touting around all of the major studios for a decade. The featurettes are on the whole predictable, and the deleted scenes seem to focus entirely on the news broadcast elements of the film. They are more single camera shots than completed scenes. The best feature has to be the director’s cut, where all of the gore and violence that was originally cut for being too graphic is now restored. So you thought that ED-209’s destruction of Mr. Kenny was harsh, see it now in its restored version. Oh my god, he killed Kenny! It’s interesting to note that the advance trailer for Robocop contained on this DVD features the music from ‘The Terminator’, so I guess the cracking score hadn’t been completed yet. This isn’t uncommon as the advance trailer for ‘Gladiator’ featured the music from ‘Total Recall’ – another Paul Verhoeven movie. The third film aside, this DVD package represents a landmark in Sci-Fi, and one of cinema’s most memorable characters. After all, who hasn’t made a Robocop costume out of cardboard and filmed their own spoof with a camcorder? …anyone?